Facebook is continuing in the pattern of getting more retailer son board, and not just through advertising. Last month we mentioned they were conducting a pilot case study in the states, with brands like Starbucks, where you could buy online to send to your friends as birthday gifts etc. Facebook now seems to have gone a step further in recruiting retail affiliates and companies. They have recently announced a new ‘WANT’ button. 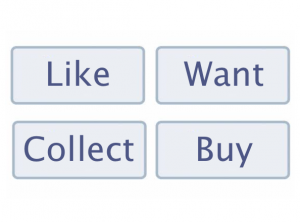 Much like the ‘LIKE’ button that all of us on the social media platform will be very familiar with, the ‘WANT’ button fashions the same sense of personal stampage. Retailer pages will be the first to display the button, as well as another new one called ‘COLLECT.’ These latest pilot additions form part of the new ‘COLLECTIONS’ feature for and designed specifically for retailers online. Retailers will now not only be able to keep tabs on their most popular products, but they will also be able to upload and create a catalogue on Facebook using brand new functionality of the site and its tools. Brands currently involved in the pilot study are Victoria Secret, Neiman Marcus and Pottery Barn – very large chains and brand names in the USA. We are a little sceptical. It seems Facebook is starting to move away from what it was originally set up for and more into the business market side of things. As if Mr Zuckerburg doesn’t have enough money already, is he trying his hand at something that in future years, could ultimate make company websites obsolete? OK, so you can’t actually purchase anything from Facebook at the moment, it sends you offsite. Does this mean then that they are trying to compete directly with Pinterest, gathering items that you ‘like’ and ‘want’ to put into your sidebar of ‘collections,’ sharing these with the rest of your Facebook friends? It seems like Facebook has now become a word and a place of ‘normality,’ where it’s almost standard that you’re part of the Facebook family. It seems that the frustration and annoyance of adverts down our sidebar has gone unnoticed and the greedy minds behind the brains are after more…money is the main driving factor here. How it works is a little more difficult, but we’ll try and simplify it as much as we can: Users will basically be offered the chance to make purchases from a retailers catalogue of products when they ‘like,’ ‘want’ or collect’ a product from the ‘collections’ section of the page. Details of product/item/interest is then shared with your friends and associates on the social media site. Granted, at times it may seem like a good idea to marry up an item seen on the Facebook page of e.g. Topshop to a quick buying solution tab ‘Want’ or ‘Collect,’ but how much will it work? The pilot is under way and we suppose it will only be a matter of time when we can search, stalk, buy and see what everyone else is buying on a platform with over a billion users. Scary or scarily clever…we’ll let you be the judge of this. You may have seen some new things appearing on Facebook recently – including ‘Facebook Offers‘. They are Facebook’s new attempt to help page owners drive traffic and sales. Currently free to run, but limited to a small number of pages, they are a great way of raising a page’s profile and gaining new likes. Once the offer is live, it’ll appear in the newsfeed and in the newsfeed of those who claim it. People can comment on the offer, like it and claim it from the newsfeed. Once someone has accepted your offer, Facebook will email the customer. They can then use that email to claim the offer! There are loads of handy hints and tips for creating an offer here. 1. Go to your page. Then from the sharing tool, click ‘Offer, Event +’ to open up the offers section. 2. Choose an image for your offer – remember that these will be shared, so the image needs to work as a thumbnail. 3. Pick a really strong headline for your offer. Keep it short and sweet and to the point. This will be shared so needs to be attention grabbing! 4. Fix up your small print – how many of your offer can be bought? When does the offer end? Anything else people should know about? Don’t forget to set an expiration date! 5. Preview the post and then post it! Sit back and see what happens. Don’t forget to try different offers and test the results! See what works for your audience! Pinterest is a visual bookmarking system that allows you to save an image you see anywhere on the internet to a ‘pin board’ that you create on Pinterest. You can create multiple pin boards to cover any subject you wish, pin as many pictures as you like with each single picture a visual representation of why you’d wanted to bookmark the page. You share every picture you pin with every other user and all your pins can be repined to their own boards without restriction, creating an incredible source for inspirational pictures. Now consider this; as a lighting retailer your website will have good quality pictures of wall lights available. I, as a consumer and user of Pinterest, like one of your products but can’t afford it right now, so I pin it to my dining room pin board along with the price so I can find it again as soon as I have the money. Now, as a Pinterest user, I have over 300 active followers for my dining room pin board. Let’s say that 10% repin that picture. If 10% of their followers repin that picture, your product just went viral. It’s believed that 80% of content on Pinterest is recycled repined pictures and it’s not unheard of for a single picture to generate over a thousand repins. Compare that to the 1.4% of tweets that are retweeted and you can see, as a social media network, people are actively interacting with other user’s content on an enormous scale. Prior to the change in Terms of Service, that picture I pinned would have been available to Pinterest as a sellable item. The Terms of Service state that users should only pin pictures that are theirs to pin, i.e. only pin your own pictures. Unfortunately, almost nobody who uses Pinterest appears to have taken this in to account and users pin everything they love regardless of copyright issues. Pinterest have made simpler tools available for users to report alleged copyright or trademark infringements but deciding on whether copyright has been breached can be a difficult decision. Pinterest is careful to link back to the original source of the picture, hence the bookmarking nature of the site, but if the user is pinning content from a site such as Tumblr where the source may not be correctly listed it’s all too easy for the copyright link to be lost. With the rise in concern over copyright issues and infringement recently due to America’s attempts to restrict the entire internet, these problems are becoming something that sites such as Pinterest are very interested in addressing. Users will need to take note and ensure they comply with copyright requirements. Pinterest is a sleek, easy to use site with a great app, making content accessible and repinable on smartphones. A browser plug-in allows you to pin content from any webpage you’re visiting without requiring access to Pinterest itself and companies are beginning to see the commercial value of the site and the number of ‘paid pinners’ is rising. Pinterest can actively increase your site’s traffic, with over 16.23 million unique visitors in February alone a single image pinned to Pinterest could do wonders for your business. Stats now show that Pinterest drives more traffic than Google+, LinkedIn and YouTube combined, so pinning your own products could prove incredibly beneficial.